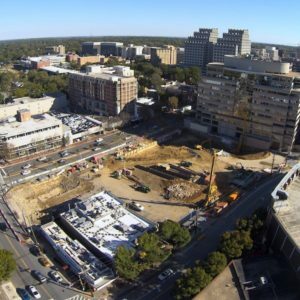 Earlier this month, the ramp into the construction site for mass excavation and hauling operations was relocated from Woodmont Avenue to Wisconsin Avenue, significantly reducing construction traffic along Woodmont Avenue. It is anticipated that these operations will continue through July with concrete operations begining in mid-May. 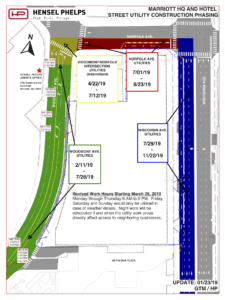 Throughout this project, the approved Montgomery County and State Highway traffic control plans will ensure minimal impact to traffic flow around the site. Underground utility improvements and restoration work continues to move northbound along Woodmont Avenue toward Norfolk Avenue and is anticipated to continue through July. 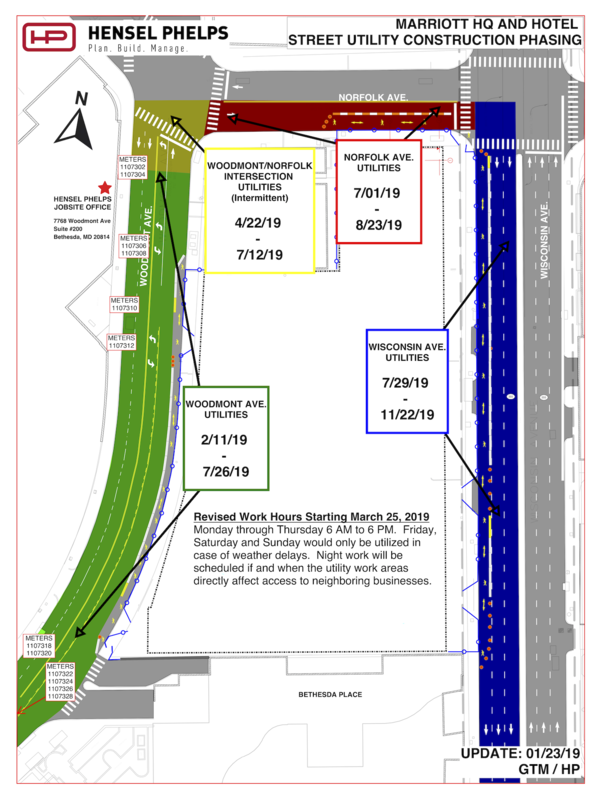 As the work at the intersection of Woodmont and Norfolk Avenues is quite deep, this work will be completed during nighttime hours to mimize potential impact to traffic and pedestrians. During this time, two-way traffic will be maintained as often as possible. The timeline for all upcoming phases of the utility work is estimated in this site plan. Please note, this plan does not include anticipated work performed by Pepco. Meanwhile, sidewalk closures remain in place along sections of Woodmont, Norfolk and Wisconsin Avenues (view map of closures here). Additional temporary closures will be necessary during this time. Pedestrians will be detoured to the east sidewalk of Wisconsin Avenue during work hours and should take advantage of nearby crosswalks as needed. Please be vigilant and pay close attention to signage as detours may change occasionally. Our number one priority is the safety and security of pedestrians and commuters in and around the construction site. The developers and general contractor are committed to an open dialog with the community and they hold bimonthly construction updates for the general public. These updates are generally scheduled for the first Tuesday of every other month and take place in downtown Bethesda at the Bethesda-Chevy Chase County Regional Services Center, on the second floor in rooms A and B, located at 4805 Edgemoor Lane, Bethesda, MD 20814. The next update will take place Tuesday, June 4 at 6:00 p.m.
For questions, contact Barney Silver, Vice President, Construction at Boston Properties; or Gavin McDuff, Area Superintendent at Hensel Phelps. Please send your email to development@MHQBethesda.com or call (240) 514-7831 to leave a voicemail message.